A unique sketch book dating back to the 1520s and linked to Renaissance artist Raphael has sold for £230,000. The manuscript was found at a stately home in Northumberland. It had only been expected to fetch about £50,000. 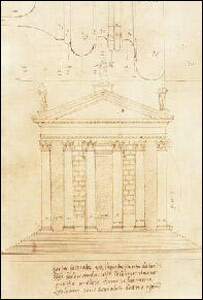 The book of drawings of Roman temples and monuments was sold by Edinburgh auctioneers Lyon and Turnbull. They were drawn by Giovanni Battista da San Gallo, a younger brother of Raphael's chief assistant in building St Peter's Basilica in Rome from 1516. The relic was bought by London-based collector Sam Fogg. Last recorded in the hands of a private collector in the 18th Century, the manuscript resurfaced last January in the library at Pallinsburn House, the home of Tyneside shipbuilding magnates. Professor Ian Campbell, an authority on Roman architectural drawing at Edinburgh College of Art, said: "Giovanni Battista could have done these drawings for Raphael and they probably give us a better impression of what Raphael intended than anything else." Auctioneer Dr Sebastian Pryke said: "This was an incredibly exciting find. "The book was last recorded in the 18th Century in the library of Baron Philip de Stosch, a celebrated collector who was also an English spy who reported on the whereabouts of the Old Pretender in Rome. "His library was sold in 1764 with most of the architectural drawings ending up in The Albertina - the drawings collection of the Vienna State Museum. "The codex however was not included in the sale and disappeared for over 200 years only to resurface in the library at Pallinsburn House." The most famous codex sold in recent years was by Leonardo da Vinci, bought by Microsoft tycoon Bill Gates for £20m from the Earl of Leicester.